We do a lot on our phones: email, online banking, navigation; and now add to that checking the content of the fridge! I'm not kidding. Samsung unveiled the European version of its newest smart refrigerator, the "Family Hub," at IFA in Berlin this week, and it's filled with features fit for the most advanced of smart homes. Its biggest selling point are the three cameras inserted on the back of the door, which take a picture of the contents of the fridge every time the door is closed. This allows users to check their food supply remotely. Who knew your asparagus would ever get a photo opportunity! In addition to seeing how many eggs you have left, the Family Hub lets you set reminders for expiration dates on your food, which you can monitor through the Food Reminder app. 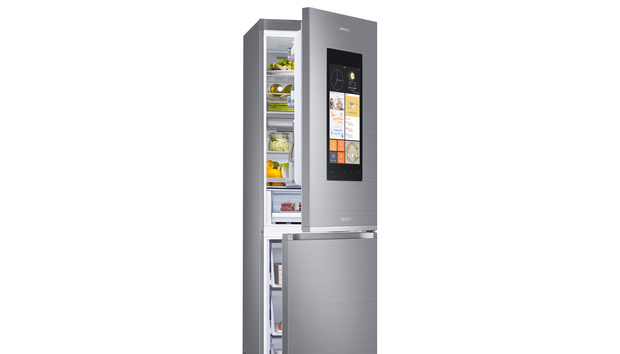 Samsung has also partnered with online grocery services to allow users of the Family Hub to order food straight from the fridge’s 21.5-inch touchscreen display and get new recipe ideas from the Club des Chefs App. The Samsung Family Hub has a 21.5-inch touchscreen display. But the fridge is not all about the food. True to its name, the “Family Hub” is meant to be a connecting point between household members. The Samsung Smart Home app allows family members to leave reminders for one another, share photos, and synchronize calendars. TV mirroring and audio streaming are also available. The Samsung Family Hub refrigerator on display at IFA 2016 in Berlin, Germany. Samsung says the refrigerator will be available in October for €4,399 ($4,906).